Can’t Make it to the March for Life? Find a Local Pro-Life Event Near You! If you can’t make it to the March for Life in Washington D.C., why not join a pro-life event in your area? Below is a list of events near the anniversary of Roe v. Wade all around Wisconsin – find something near you and join pro-lifers in your area! We will continue to update this list, so check often! 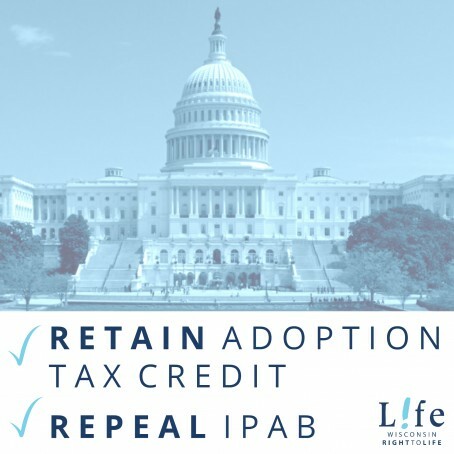 Call Sen. Ron Johnson, Sen. Tammy Baldwin, and your member of Congress to urge them to retain the adoption tax credit and repeal IPAB! Right now, Congress is considering H.R. 1, the Tax Cuts and Jobs Act of 2017. Some members of Congress are considering ending the adoption tax credit (section 1102(b)) and the exclusion for adoption assistance programs (section 1406). Both significantly help parents as they face steep financial expenses when adopting a child. The Independent Payment Advisory Board (IPAB) is composed of 15 unelected bureaucrats who recommend measures to limit private, nongovernmental spending on health care to a growth rate below medical inflation, along with limiting government spending in Medicare. Despite media reports, IPAB’s powers do go beyond a benign effort to control Medicare spending. IPAB would recommend drastic limits for the Department of Health and Human Services to impose on what Americans are allowed to spend out of their own funds, to save their own lives, and the lives of their families. H.R. 849, the Protecting Seniors’ Access to Medicare Act of 2017, would repeal IPAB and protect Americans from health care rationing. Support H.R. 849, the Protecting Seniors’ Access to Medicare Act of 2017, would repeal IPAB and protect Americans from health care rationing. Email Chelsea Duffy at cduffy@wrtl.org with any feedback you receive. 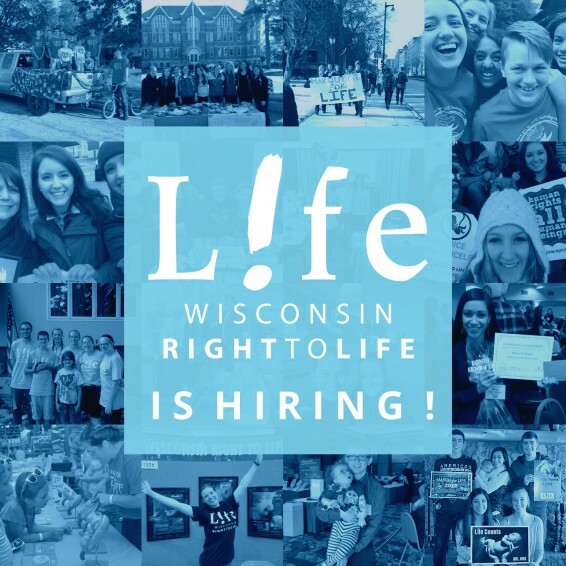 Wisconsin Right to Life is hiring. Qualified applicants must be fully committed to Wisconsin Right to Life’s principles; have knowledge of Word, Excel, and general computer skills; have good organizational abilities; be self-motivated; and possess excellent phone communication skills. This is a full-time position. The terrible news broke Friday afternoon: Planned Parenthood will open a new, $8 million, state-of-the-art abortion facility in Milwaukee, Wisconsin on Tuesday, October 10th. Adding to this shocking news is the fact that the abortion giant is paying for the new killing center entirely with private donations. The new facility will be located in Milwaukee’s trendy Third Ward, home to some of the city’s most expensive real estate. In addition, the 12,000-square-foot clinic will feature an expanded waiting room, more exam and consultation rooms than their existing Milwaukee facility, as well as areas for women and children. Children can relax and play in comfort while a little brother, sister, cousin, or friend loses their life only a few feet away. Yet again, this leaves us with just one question: Why does Planned Parenthood need taxpayer money? 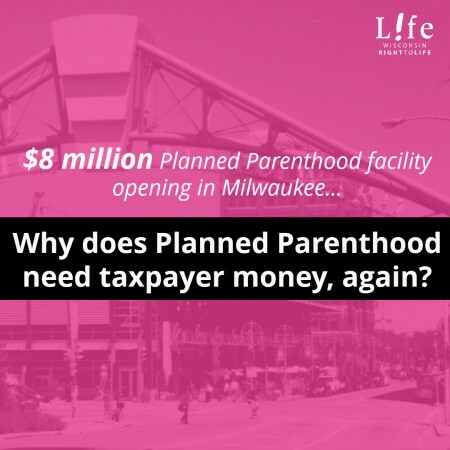 The fact that Planned Parenthood continues to insist that they need taxpayer funding while building an $8 million facility with private funds is beyond the pale. It is shocking that they blame Wisconsin’s protective, pro-life laws for the closure of rural clinics while, at the same time, they build an upscale clinic in Milwaukee’s hot spot: The Third Ward. Planned Parenthood’s true colors have been exposed once again: They don’t care about women. They care about money. Planned Parenthood always follows the money — whether it be from taxpayer’s wallets, gullible donors, or exploiting women at the expense of their children’s lives. Within the last six years, Wisconsin Right to Life supported legislation signed into law that directed a cumulative $8 million away from Planned Parenthood of Wisconsin. The fact that money continues to flow through their doors is proof-positive they have no need for taxpayer dollars. Here in Wisconsin, the number of abortions has been dropping steadily for years. In fact, it has dropped 15% in the last three years alone, to an all-time low of 5,612 abortions in 2016. Of course, that is 5,612 abortions too many, but the steady decline has shown that our strategy of combining a strong legislative agenda along with our powerful Veritas media campaign targeting abortion-vulnerable women is working. Despite our success, Planned Parenthood continues to be Enemy #1 to women and children everywhere. We will continue to urge legislators to completely defund the abortion giant. We will continue to fight for laws that protect unborn children and their mothers. We will continue to educate society regarding the truth about the abortion industry so hearts and minds are changed to favor life. We will not stop until every vulnerable member of our society is protected. Is Obamacare Repealed Yet? …No. Again. Obamacare has not been repealed. The latest effort, the Graham-Cassidy-Heller-Johnson bill, has failed. Thanks to the capitulations of three senators, Obamacare is still the law of the land, and Planned Parenthood is still funded. This is a major disappointment, and frankly, unacceptable. 1.) Sen. Ron Johnson truly gave his all for this effort, and promises he won’t give up. Please call and thank Sen. Johnson at 202-224-5323 and thank him for his dedication! 2.) Sen. Tammy Baldwin refuses to even consider any plan to repeal Obamacare. Call Sen. Baldwin at 202-224-5653 and let her know that abortion-supporting Obamacare must be repealed, and any replacement must have pro-life provisions. 3.) Remain vigilant. We must keep the pressure on! If you haven’t already, sign up for WRTL’s Action Alerts and follow us on Facebook, Twitter, and Instagram to stay informed. Be assured that no matter what, your efforts to be a voice for the unborn matter. Keep up the great work, for the sake of those we work to protect! Today, House Majority Leader Kevin McCarthy (R-CA 23) announced that the U.S. House of Representatives will vote on H.R. 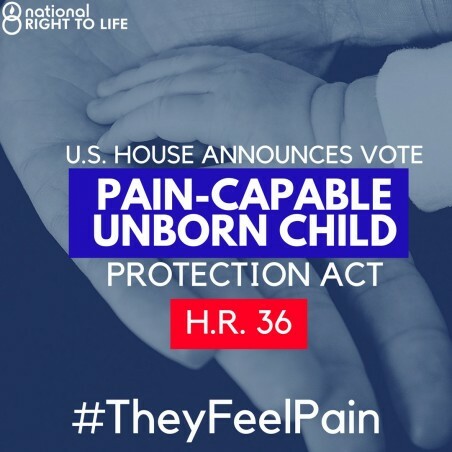 36, the Pain-Capable Unborn Child Protection Act on October 3rd. The Pain-Capable Unborn Child Protection Act protects unborn babies capable of feeling pain from gruesome, late-term abortions. Learn more about how unborn babies can feel pain. Call your representatives and ask them to support H.R. 36! Don’t know your representative? Find out here. *Co-sponsors of H.R. 36 should be thanked for their up-front support of this lifesaving legislation! On September 13, 2017, U.S. Senators Lindsey Graham (R-SC) and Bill Cassidy (R-LA), along with Senators Dean Heller (R-NV), and Ron Johnson (R-WI), introduced a bill to repeal Obamacare. 2.) It repeals tax credits that have been used to pay for healthcare plans that cover abortion. 3.) States would receive block grants to implement this health care policy, but those block grants would be subject to Hyde amendment protections that prohibit taxpayer funds from covering abortions. 4.) If this effort fails, Obamacare remains the law of the land. As you all know, the last effort to repeal abortion-supporting Obamacare was not successful and very disappointing. Now is the time to act. This is our best bet for taking down abortion-supporting Obamacare and providing protections for the unborn. Call Sen. Ron Johnson at 202-224-5323 to thank him for being a co-author of this bill. Call Sen. Tammy Baldwin at 202-224-5653 and urge her to support the Graham-Cassidy bill. Questions? Email WRTL’s Legislative Director Chelsea Duffy at cduffy@wrtl.org. *Because this is a “reconciliation” bill, there is a limit to the length of time the resolution is in effect. So, under this particular bill, Planned Parenthood can only be defunded for one year because of the limits of the reconciliation process. Reconciliation bills are increasingly common for fiscal policies, as congressional leaders wish to avoid future government shutdowns and filibusters from the minority party. We, the pro-life movement, have fought so hard these past seven years to get rid of Obamacare. We’ve called our leaders, kept them accountable, and now – we are the closest we have ever been to taking this abortion-supporting and healthcare-rationing law down. So is Obamacare repealed yet? Sadly, no. 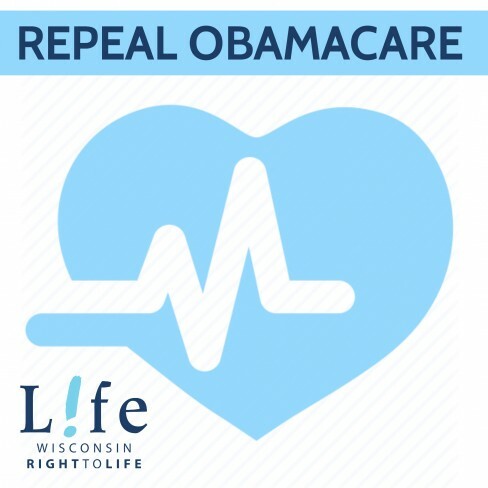 Wisconsin Right to Life has been monitoring this effort to repeal Obamacare amendment by amendment since Sen. Ron Johnson (R-WI) and Vice President Mike Pence cast the key votes on Tuesday to open debate on this important subject. The Better Care Reconciliation Act is updated and still retains some pro-life language. Since there wasn’t sufficient time to get a cost estimate for the bill by the Congressional Budget Office, 60 votes for the bill were required for passage. Because of this, there were not enough votes for passage and the bill failed. A slew of various amendments to the reconciliation bill were proposed and failed to pass. Among them was an amendment by Sen. Ron Johnson (R-WI) to force Congress to be under the same Obamacare regulations as the rest of America so they understand how dire the situation is to live under that law. Also among the various failed amendments was the Obamacare Reconciliation Repeal Act which would repeal most of Obamacare without a replacement. Sen. Luther Strange (R-AL) introduces an amendment (the “Strange Amendment”) which would extend Hyde protections to the reconciliation bill to prevent taxpayer dollars from covering abortions through tax credits. Since this bill had no cost estimate, 60 votes were required for passage. Every Democrat, including Republicans Sen. Susan Collins (R-ME) and Sen. Lisa Murkowski (R-AK) voted against this measure. However, this amendment received the most Republican support of any measure since the debate began, with 50 Republicans voting yes. Very early this morning, the “Skinny Repeal” bill that would at least defund Planned Parenthood for a year failed. Republicans Sen. John McCain (R-AZ), Sen. Susan Collins (R-ME), and Sen. Lisa Murkowski (R-AK) along with all Democrats voted against this measure. We heard reports that Vice President Mike Pence was on the Senate floor late last night and early this morning doing everything within his power to convince Senators to act. President Trump even made a call to Sen. John McCain in the hopes of convincing him to vote for the Skinny Repeal. After hours of grueling debate and the final failed passage, Majority Leader Sen. Mitch McConnell (R-KY) openly lamented the lack of action and closed debate. Like I said before, this is the closest we have ever been to taking Obamacare down. However, this week was incredibly disappointing. What we have to do now is keep the pressure on. Call Sen. Ron Johnson at 202-224-5323 to thank him for taking action and to urge him to keep up the fight. We need to have an Obamacare repeal that has pro-life language! Call Sen. Tammy Baldwin at 202-224-5653 and urge her to support an Obamacare repeal with pro-life language! I cannot imagine what it must be like for any parent to hear that deadly word – futile – and have that mean to your medical provider and to the state that you are now powerless to fight for your child. “Futile” has become a loaded word, no longer determining whether a treatment is useful, but rather if a person is worthy of treatment. The subjectivity and false finality of this word has resulted in the premature deaths of so many. Now, that word will lead to the death of baby Charlie Gard. 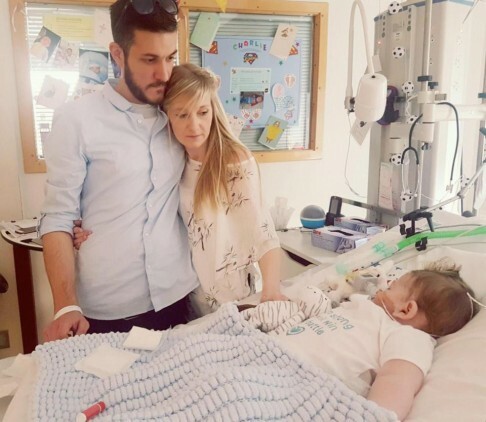 Today, Charlie Gard’s parents announced that they are ending their protracted legal fight for Charlie. Too much time has passed for him to have any chance of successful treatment. Here is their full statement. This morning as I was driving from a meeting, I reflected on this tragic situation. For me, my family has been lucky – we have never had to fight for our kids’ basic right to live or receive treatment. Maybe we have disagreed with our pediatrician a couple of times over minor things such as whether or not to supplement our kids’ diet with formula or exclusively breastfeed. We knew our pediatrician had the best in mind, but if we as parents ever disagreed, all we ever had to say was no – and that was the end of it. Otherwise, we knew we could find another provider. Because, at the end of the day, they are our children. We have a say. However, in my work at Wisconsin Right to Life, I know of so many parents who fight so hard for their children with special needs to receive basic care. Their kids are much like Charlie, and are too often denied not only experimental treatment, but also basic food, water, and ordinary care. The right of these parents to transfer their children to a different provider is basic and essential, and very often a matter of life or death. Charlie’s family is living through the unimaginable for any parent, whether our kids are medically fragile or comparatively healthy. When he was given the “futile” label, they could not transfer him to a different provider. Instead, they were forced to take their fight to the judicial system, wasting every crucial minute in court instead of working to get Charlie the care that he needed. Now, tragically, it is too late for him. My heart utterly breaks for Charlie’s parents. A parent’s job is to protect their child. The UK’s court system, government, and health care system were all obstacles to Charlie’s parents’ ability to do their job, and now Charlie will lose his life because of it. I applaud Charlie’s mom and dad for their fight. For Charlie’s sake, his family’s sake, and the sake of so many families like them, we need to share his story. The more we push back against the culture of death and expose it for what it is, the less likely it is that a family will ever have to suffer such a needless battle for their child. We can end the deadliness of the “futile” label, and ensure that every parent has the right to fight for their children. Fundraise your way to LifeCamp! Do you want to be a hero and save lives? Looking to make friends that share the same values as you? Want to go to camp this summer? Join us for L!fe Camp Sunday August 6th, 2017 through Friday August 11th, 2017! Teens aged 14-19 are encouraged to join us for L!fe Camp this year in Green Lake, Wisconsin. During this week-long camp teens will learn a number of skills not taught in many public schools: logic, reasoning, the legislative process, and how to change their world, all through the lens of life issues. Campers will also spend a day in Madison learning from elected officials and policy makers who work to protect life on a daily basis. Finally, campers will have FUN hiking, swimming, zip-lining and more! Campers Can FUNDRAISE Their Way to Camp! Hit one of the two green buttons that says, “Fundraise”. You will be taken to the page to set up your own fundraiser. Make sure you select the “Send a Teen to L!fe Camp” campaign. Under “What Do You Want to Call Your Fundraiser” create a name that helps people know what you’re fundraising for, such as “Help Send Me to L!fe Camp!” or “Please Help Me Learn How to Save Lives” or whatever works for you. Under “Tell Supporters Why They Should Give to the Cause You’re Fundraising For” include a few words about why people should help you go to camp. Don’t forget to upload your picture so your friends and family know this is a legitimate fundraiser! When you’ve completed these steps, hit the green “Create Your Fundraiser” button and, voila!, you have a fundraising page. Be sure to share your fundraiser often on social media, and e-mail it to your grandparents, aunts, uncles, cousins, or anyone who might support your efforts to go to camp. You can also mention that all donations are 100% tax deductible and will make an incredible difference in a young person’s life. Our software will keep a record of the donations you receive and we will discount your camp registration based on the amount you raise. If the amount you raise exceeds the cost of camp, you can rest assured these donations will help other teens enjoy L!fe Camp, as well! Your ticket for the: Can’t Make it to the March for Life? Find a Local Pro-Life Event Near You!